How has the AIP changed your life? The two biggest changes have been my health and the way I live my life. First, when it comes to lifestyle, it should be noted that I live in a community that’s VERY focussed on eating out and food in general. I used to indulge and eat out as often as possible. Now, 95% of my meals are home-cooked and taken with me wherever I go. I’m now over the stares I get when I unpack my lunchbox at the mall foodcourt, or order very specifically when I do go out. I also find that I’m less concerned about the opinions of others generally. I no longer feel pressured to be the life of the party or to go out late with friends and instead let them know that my choice is to stay home and get to bed at a decent hour. Secondly, when it comes to my health, I’ve found pretty much complete relief from my inflammation and I know my triggers (sugar is the worst), so it’s easier to avoid foods that make me feel bad. I’d have to say that AIP has empowered me to take care of myself. Have you successfully reintroduced any foods? Thankfully I’ve been able to reintroduce black pepper (makes eating out easier), the occasional egg and I seem to be okay with chocolate in moderation (WOO HOO!). Size of your kitchen: Sadly, apartment living means that my kitchen is small, but thankfully not the smallest I’ve ever had to work with. It’s about 10 by 10 feet and has a decent amount of cabinets and countertops (for an apartment). Favorite thing about your kitchen: I’m going to cheat and list two: 1) a lamp I bought in Turkey that casts the most beautiful glow especially when reflected off the mirror, and 2) a small Dutch oven that belonged to my grandmother. The thing weighs a ton and I brought it back from the States in my suitcase a few years back. I love any opportunity I can find to use it. It just makes me smile. Least favorite thing about your kitchen: Got to be my stove/oven. I love that it’s gas but I dislike the fact that apartment living means an apartment-sized stove. It’s got four burners and a small oven, so batch cooking and holidays are a challenge. Are there any cheap gadgets or little tools that you have found make AIP easier? I LOVE my immersion blender and my two-cup food processor. They make soups, dressings, etc. a breeze and are both easy cleanup. My roommate loves using my handheld spiralizer, but I can’t stand cleaning it, so zoodles aren’t common on my meal plan. What is the biggest thing that changed in your kitchen setup when you adopted the AIP? About the same time I started the AIP, I switched to glass storage containers, so that required a financial investment as well as more storage space. If someone was just starting to invest in some useful but more expensive kitchen tools, which one would you tell them to buy first? I would have to say a slow cooker. I love using mine to ‘roast’ whole chicken and make bone broth. I’ve heard wonders about the Instant Pot and wish I had one, but since I don’t I’ll stick with the tool I use and love. I buy lots of frozen veggies. I’m especially fond of veggie purees (celeriac, broccoli and carrot) as they can be eaten as-is, added to soups and stews and save TONS of time. I clean as I go even more so than I used to, and try to make the best use of a few spare moments (like while food is heating up) to wash dishes, wipe the counters, etc. Batch cook, batch cook, batch cook! Or, at the least make enough of each meal for some leftovers. I’d never be able to think about breakfast in the morning if it weren’t for leftovers. How do you deal with food for family members that are not AIP? I’m single, so it’s not really an issue for me. Although my roommate does eat some non-AIP foods in the house. I just make sure dishes are well washed. Are there any tools or appliances that you’ve stopped using now that your diet has changed? Nothing that I used regularly, although my baking stuff gets a lot less use now. What are your favorite meals to batch cook? I love batch cooking soups and stews. Some of my favorites are: Smoky AIP Chili and Carrot Soup. I also enjoying making lots of burgers/ breakfast patties, meatloaf and these Tuna Bites. 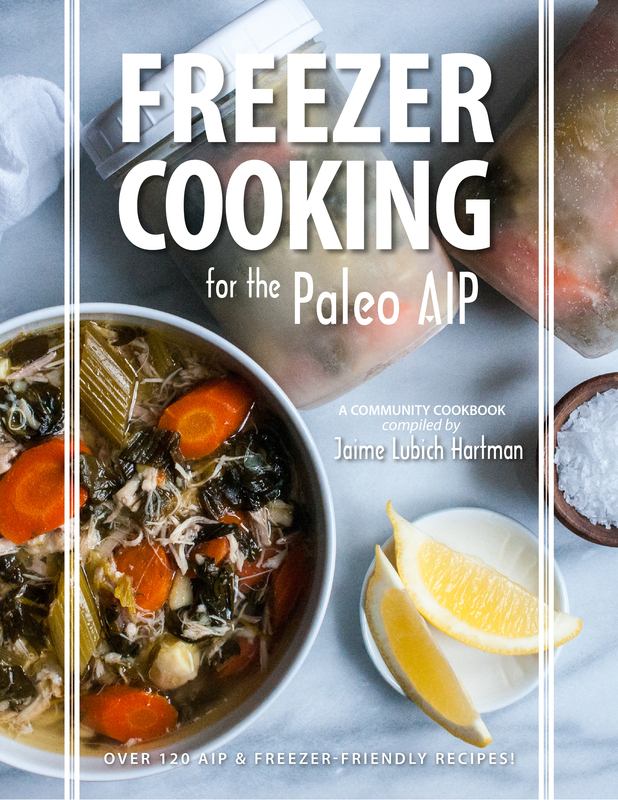 What are your favorite AIP and Paleo cookbooks? Honestly I’ve never been one to really follow recipes. I love to buy cookbooks and use them as inspiration and in fact I still regularly flip through all my non-AIP cookbooks for ideas of things to adapt. One that I do use all the time though is He Won’t Know It’s Paleo. I actually started following Bre’anna on Facebook right about the time she got started and used a lot of her recipes before taking the Paleo/AIP plunge. I’m also really looking forward to the Healing Kitchen as what I’ve seen so far looks amazing! Do you have any tips for those starting an elimination diet and setting up their kitchens for the first time? I think the biggest tip is to recruit support from your family and friends. You cannot do this alone and will need their help. Secondly, I would encourage purging your kitchen of things you might reach for in a pinch. Finally, never let your pantry or fridge get bare. If you don’t have something AIP to eat, it’ll be a lot harder to say no to the drive-thru or other easy-to-reach temptations. If you’d like to read more about Bethany, find her on her blog, Adventures in Partaking, on Facebook and on Instagram.